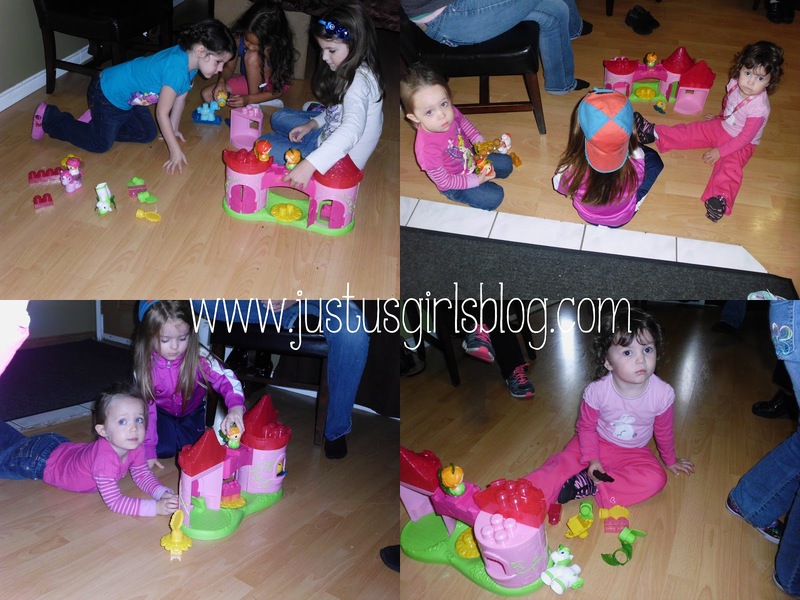 I had the opportunity to host a Princess Mega Bloks Party courtesy of Mommy Parties. Let me tell you, when I received all the goodies for the party, my daughter was super excited. First thing I did was make a guest list and then decided on what would be served. When the guests first arrived we served lunch since it was one o'clock when the party started. Served were hot dogs, chips, juice boxes, chocolate chip and chocolate cookies. After lunch was served and gobbled up I then let all of the girls pick out which Mega Bloks Lil' Princess they wanted to play with and take home. They had an option of choosing one of three Lil Princesses; Princess Dewdrop, Princess Sunray and Princess Starlight. Each Princess Mega Bloks included the Princess, her pony, removable sparkling wings and three sparkling Mega Bloks. Each Mega Bloks Princess retails at around $7.99. Once they had chosen which princess they wanted I then began to open up the Three Story Enchanted Castle for them all to play with. The castle has three different ways that you can build it and also includes Princess Ivy and her pony, Chestnut. It also came with stickers so the girls could decorate the castle, which they thought was pretty cool. The girls had tons of fun playing with their princess and the castle. They absolutely loved the castle and loved how it came with two chairs and a table so the Princesses can hangout together. The Three Story Enchanted Castle is retailed at $34.99. The Mega Bloks were a hit with all of the girls. After about an hour and a half of playing and the moms chatting, I then had all of the moms write their kids name down on a sheet of paper and then I proceeded to pick one name from a hat to see who would win the Mega Bloks Lil's Princess Magic Carriage. The Carriage includes Princess Blossom along with her pony, Rose and retails at $19.99. What's cute was the winner wanted to open the carriage instead of taking it home so all the girls could play with it along with the castle and they did. This kept the girls super busy and occupied and I'm happy to say there were no fights at all. All the girls got along and shared all of the Mega Bloks. When it was time to leave none of the girls wanted to go. Nearly three hours weren't enough. They wanted to continue to play, together and with the Mega Bloks. For hours of fun I highly recommend the Princess Mega Bloks and since Christmas is around the corner, maybe Santa will be stopping by with these for your little Princess! Disclosure: All opinions are my own. I received Princess MegaBloks package from Mommy Parties at no cost for the purpose of this review and to host a party. No other compensation was received.